Internal hemipelvectomies involve resection of part or all of the innominate bone with preservation of the extremity. 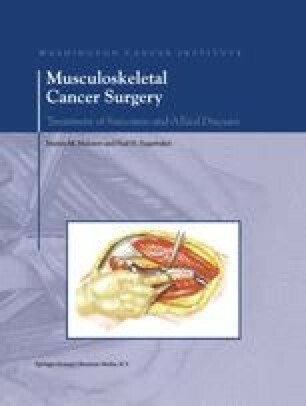 This chapter will describe the surgical technique of resection of the ilium (Type I pelvic resection) and the pubic region (Type III pelvic resection).These resections do not violate the hip joint and minimally compromise the stability of the pelvic girdle, and therefore do not require reconstruction. Detailed preoperative evaluation and meticulous surgical dissection are crucial because of the close proximity of the pelvic girdle to major blood vessels, nerves, and internal organs in these regions. The surgical technique of Type II (periacetabular) resection is described in Chapter 28.